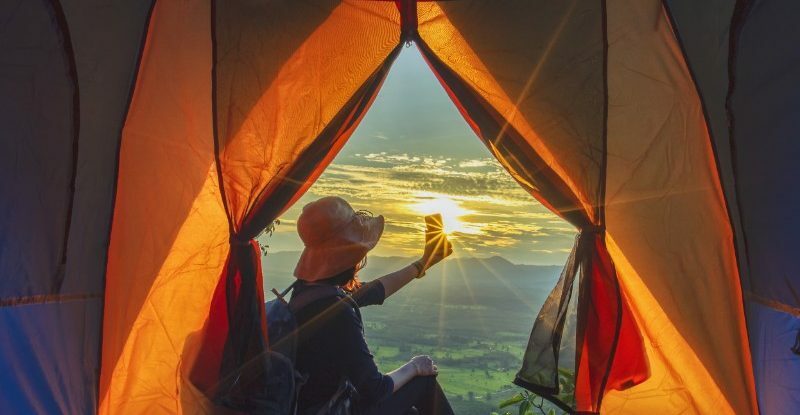 If you’re a camping fiend who’s always after the latest and greatest gear that will best benefit your camping experience, then we’ve got good news for you! We’ve compiled a list of the best tents available on Amazon to help make your tent decisions a little bit easier. Whether you’re wanting to find the best all-season tent out there, you’re seeking out the ultimate backpacking tent, or you need something with all the bells-and-whistles for family-style camping, we’ve got it right here. Check it out for some tent inspiration. You might just find the perfect tent you’ve been searching for. Spacious, comfortable, and convenient, the Coleman WeatherMaster 6-Person Tent is the ideal addition to your camping needs if you and a large group (or the family) want to reconnect with nature. With easy set-up (it takes less than 20 minutes), this 6-person tent includes clip-suspension, slip-proof-pin systems, and secure poles to ensure a taut, safe space. This tent also includes a special tub floor that has welded corners, covered zippers, and protected seams. Plus, it comes with a rainfly. At about 11 feet x 9 feet of interior room, you can fit up to two queen-size air mattresses. It also comes in a 10-person option, as well. Another Coleman special, this (smaller) but just as aptly-designed tent is a great option for smaller groups headed out into the wild. With a dome design that reaches up to 7 feet, you’re gifted with a comfortable interior that allows most people room to fully stand up inside the tent. It takes about 10 minutes to set up fully (less if you convince your group to help) and features large windows as well as a ground vent for extra ventilation and exceptional breathability. The installed WeatherTec system makes this tent a great option for rainy-day camping. We’ve got another one on the list for large groups of people who want to camp together. If you’re nervous about splitting up your large group of campers into separate tents, the CORE 9-person tent is a perfect choice. Although it only stands about 72-inches at its tallest, this tent is about 16 feet by 9 feet in length and width, giving you a ton of room to move about and sleep without being too cramped. You can fit about 3 air mattresses inside this tent and it even features a special gear loft on the ceiling for extra organization, as well as lantern hooks and pockets. This little number is more geared toward smaller groups of people, or individual campers, who are looking to get out and about for a little exploration. Crafted with durable material, this spacious and convenient tent is lightweight, compact, and ideal for both spring and summer camping. This is a great tent for backpackers because it’s so compact and lightweight, but is not advised for cold weather or snowy conditions. The dimensions of this tent are 3.5 feet x 6.25 feet x 4.80 feet, making it an ideal space for you and one other camper. This bad boy is for the solo camper who is looking for a well-equipped, but budget-friendly, mountaineering tent. Boasting an incredibly easy setup, the Lynx Tent is a free-standing, two-pole design, making assembly an absolute breeze, a much-lauded feature when you’re out camping alone. It’s a tiny tent, making it lightweight and perfect for backpackers, weighing in at about 4 pounds at max. This tent is perfect for folks who are looking to set up their tent and drift off to sleep but note it’s not a great all-around shelter if you need to be up and about and moving around, as it’s only about 36 inches tall. A clever, spacious, and comfortable tent, this Wenzel 8-person Klondike Tent is a glamour campers dream. With a specially-designed attached screen room, you and the family can camp together with a little extra space. Weighing in at 23 pounds, this moderately-heavy tent measures about 16 feet wide by 6.5 feet high, so most people will be able to fully stand up inside the tent. This spacious tent also features weather-repellent fabric for rainy days and nights, full mesh roof options, and a rain fly. Another Coleman added to the list! This 8-person tent has plenty of space for a group of campers looking to adventure outside. With measurements like 15 feet by 12 feet by 6 feet, you’ll be able to fit a group of people comfortably, as well as two queen air mattresses inside. Additionally, this awesome tent features a screened room for a little extra space for lounging around bug-free. It includes a rainfly and only takes about 15 minutes to set up. It should come as no surprise that we’re ending this list on yet another Coleman tent. What can we say, we’re Coleman crazy! With enough space to fit four people inside, this tent measures in at 8 feet x 7 feet x 4.11 feet. So, even though most folks won’t be able to fully stand up, it’s still a relatively roomy tent. The best part about this tent? It’s in the name – instant! This tent takes less than a minute to set up, making it an ideal choice for folks who hate the 15-20 minute drag of putting together a complicated tent.